Designed for caulk tubes and other similarly shaped product, this custom system features an infeed ramp with pneumatic escapement, a top-mounted wrap station, and a 48″ length conveyor. Products are loaded onto the infeed ramp by a customer-furnished transfer, aligned by the guide rails and labeled by the Q60 label applicator. 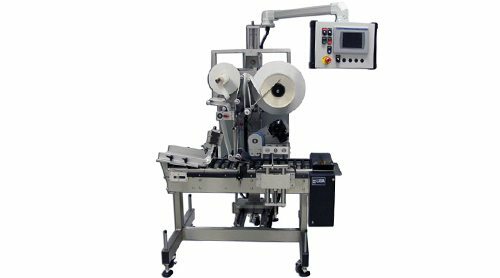 The top-mounted wrap station belt rotates and impresses the label around the product.